Welcome to the blog of Keith Hansen! I am a wildlife artist who specializes in the inspirational and accurate portrayal of birds. I was raised in a family of artists and lovers of all things natural. This combination of creativity and care for our natural world has hopefully become manifest in my works and images. If you are interested in learning more about how I first got inspired to look at and then begin illustrating birds you can go to my web site at www.keithhansen.com What you will find before you are bits and pieces of my life. Please feel free to stop by from time to time so that you can stay abreast of the various interests, bird sightings, current art projects, images and just plain old cool stuff! Also, feel free to write comments, or just say hi! ps. I’ve just started my own blog, and mentioned you! It was a pleasure to have time with you yesterday in your home-like studio, filled with treats for the exploring eye. 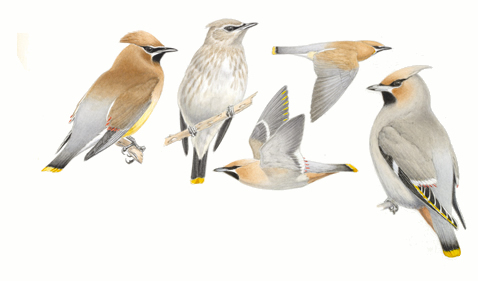 Your careful precise illustrations of our feathered friends are just breathtaking. And thanks Keith for spending time to chat and getting to know us a wee bit. We would like to follow your career. this is Mitch Jeserich…I was the man in the wheelchair who visited you on June 5th with my friend Kim. It was a great pleasure to have had the opportunity to meet you and see where you work. Thank you for your hospitality. I also produce a daily radio show for the Pacifica Radio Network and KPFA in Berkeley. It would be great to stay in touch and perhaps have you on as a guest now and then. thank you for today…it was a real thrill. Thanks for the note! I too had a great time talking with you and your friend. Ya know, many people flow through the gallery, but every so often I meet someone who I really feel like I have known for a long time. You are one of those people and while we have not met, I certainly know you through KPFA and it was a pleasure and an honor to actually meet you. Please pass on my best wishes to your friend! Please stop by next time you find yourself here in Bolinas. I had to laugh a few minutes ago as I realized that I was sitting beneath your Migration painting as I was reading your blog. I haven’t been down to your studio for a few months, the last time when my wife Cristina and I introduced you to Ritchen, our friend from Bhutan who enjoyed so much his internship at Pallormine Station. I’ve really gotten hooked on carbon-free birding, trying as often as possible to bike straight from our house in the Oakland hills to some of the better locations nearby. Today though we drove up to Grizzley Island, the location where we first started birding by joining a Golden Gate Audubon outing back in 1988. I was just checking the Point Reyes Birding Festival schedule and was amazed at how many outings are scheduled. Can’t attend this year, but hope to for the first time next year. Point Reyes and Bolinas are truly my favorites places to visit. Best wishes on the coming publication of your Sierra field guide.